Note the two new parameters: helical angle, which is the amount of twist around the axis, and flip, which is the rotation around the axis of the gear train. The latter s needed because a driven gear is at 90 degrees relative to a worm gear. 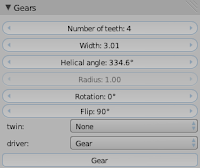 A long time ago I wrote an addon for Blender 2.49 to create gears or cogwheels. It works quite well and it even is included as part of Blenders bundled scripts. Over the years it was maintained by other developers so it still works for Blender 2.68. When the script was written, Bmesh support in Blender was not even a glimmer of an idea so the code that creates the actual geometry isn't exactly elegant. Redesigning for Bmesh not only makes for cleaner code but is also a personal incentive to learn more about this Api, which isn't always completely documented (return values from operators are often dictionaries with all kind of geometry information yet the different values they contain are often not described in full) but which is both powerful (supporting complex operations like duplication and extrusion) and fast (implemented in C/C++, Python is just a thin wrapper). When I was working on the floorboard generator Marcatore showed me a design by DragonLee to make options persistent. The original gears addon suffers from the same affliction as many other addons in that once the object is created you cannot easily tweak it. 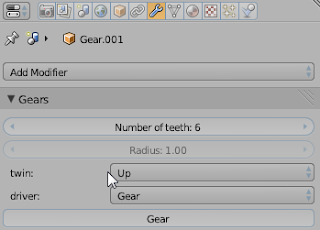 You can of course manually alter the mesh but the option sliders are gone from the toolbar as soon as the mesh is manipulated in any way. 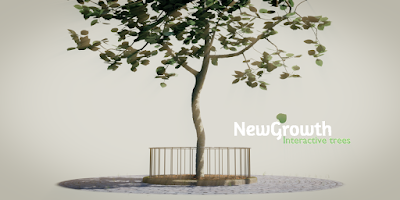 What we really want is the possibility to tweak the options even after saving and reloading the .blend and this exactly what DragonLee's method makes possible, paving the way for truly parametric objects. Configuring a rig or drivers to let one cogwheel drive a bunch of other cogwheels is not that simple and rather time consuming. So the new design should feature drivers and keyframes that allow for instant animation, which then of course may be adapted to your specific needs. Many addons are not written with user friendliness in mind and I am guilty of this sin as well. 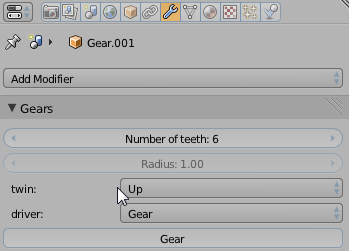 There are basically two solutions to this problem (and they can be used in parallel): One, use your own addon extensively, asking yourself with each mouseclick if it is necessary and with each option you introduce if its description is clear and relevant, and two, interact with the community, for example on Blenderartists. Ask what features they miss and ask explicitely how usability might be improved. Do this early on, not when your script is almost finished, although it should already be quite usable when you introduce it, otherwise no one will try it out. At this point you will have an animated gear train. You can step through the frames to see it move. At the location of the first gear is a spherical empty (called GearHeadEmpty) which can be moved and rotated to position the whole gear assembly in any way you like. Select the second gear and choose Up from the Twin dropdown. 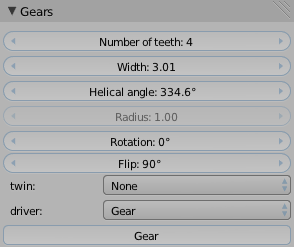 The gear will move to the location of first gear, slightly shifted along the z-axis and its animated rotation will be identical to that of the first gear, all as if both gears are connected to the same gear axis. Select the fourth gear and choose Up from the Twin dropdown like you did for the second gear. Step through the frames or press ctrl-A to see the gear assembly move.